Whether sick, injured, or just young and hungry, all of our patients need help. But the blind seals and sea lions we treat require lots of special care. Solar rests on the beach while Roknrole tests out the water after their release at Chimney Rock. After a five-month stay at the Center that included challenging cataract surgery, Solar was released back to the ocean on August 28. This elephant seal pup was born with cataracts in both eyes, making it very difficult for him to survive. Thanks to the state-of-the-art treatment he received, along with "fish school" lessons in how to catch and eat fish, he was able to return to his natural habitat. Together with Roknrole, an elephant seal pup that was treated for malnutrition and parasites, Solar was released at Chimney Rock, in the Point Reyes National Seashore. His vision will never be completely unimpaired, but an elephant seal relies much more on other senses when he forages deep in the ocean. Elephant seals are known for their deep diving and go as much as a mile below the surface of the ocean to hunt for food. Like Cappy, an elephant seal pup that had cataract surgery at the Center last year, Solar has a good chance of survival in wild, a place where he truly belongs. Solar, an elephant seal pup, has cataracts in both eyes. Blindness in seals and sea lions is not as uncommon as you might think. It can be the side-effect of having big eyes and big teeth—two things that don’t necessarily go well together. Having large eyes is a great adaptation for seeing in dark water, but the cornea (the clear outer covering of the eye) can be easily damaged. While none of the species we care for are at much risk for putting their own eyes out, they can definitely cause trauma to each other. This is likely what happened with a few young California sea lions we’ve treated in the last few months, including Winky, a juvenile male who had enough trauma to one of his eyes that his cornea essentially popped. When this happens, the eye can shrink down and become non-functional—a condition called “phthisis bulbi” (pronounced like “thesis bulb-eye”). Once the eye has shrunken down, it is no longer painful and can be left alone in most species. Luckily, this was the case for Winky. He remains in our care while we assess some of his other health issues, including pneumonia and a flipper wound. There are many causes of eye trauma in the patients that we treat. Bullets, falling (or other types of blunt trauma) and even whiskers (called “vibrissae”) can cause damage to a seal or sea lion’s eyes. Once the cornea is damaged, it is easy for infection to set in—especially in species that spend so much time in the water. Encumbrance, a California sea lion, had an infected eye that required removal. If an animal’s eye is non-visual but infected or painful, we can perform an enucleation, a procedure in which the eye is removed. This was the best option for Encumberance, a California sea lion pup that was admitted to our hospital on May 18 with a severe infection in one of his eyes. After his infected eye was removed, Encumberance began to improve. After six weeks in our care, he was released at Chimney Rock in Point Reyes National Seashore. How we treat eyes depends on the type and depth of damage, and we often consult with an ophthalmologist when we’re diagnosing and treating eyes. Our friends at Animal Eye Care in Fremont, California, generously provided their services to help us care for Encumberance and many of the other blind animals we’ve treated this year. Trauma isn’t the only cause of blindness, and one patient in our care right now is an interesting example of that. Solar is a northern elephant seal that was blind when he was rescued by the Santa Barbara Marine Mammal Center at the end of March and brought to The Marine Mammal Center for rehabilitation. During his admit exam, our veterinary experts noticed white spots in the middle of his eye. On closer investigation, they realized this was his pupil. The pupil is the space in the iris where light enters the eye. The lens, located behind the iris, refracts and helps direct the light rays toward the retina, the back edge of the eye where light is received and translated for the brain. Usually the pupil appears black because light passes through it and not enough of the light rays reflect back for us to see. In Solar’s case, the pupil appeared white, indicating that the light wasn’t getting to the retina because the lens wasn’t clear. This condition is known as cataracts, and Solar was suffering from it in both eyes, rendering him completely blind. But luckily for Solar, in cases like this, blindness can be a reversible process. A volunteer administers eyedrops to Solar. We brought Solar to Animal Eye Care where Dr. Patricia Smith removed the cataracts via a process known as “phacoemulsification,” in which sound waves are used to break down the clouded lens of the eye. Once the lens is broken down, light is able to reach the retina and vision may be restored. After the surgery, Solar needed special care to ensure his eyes healed properly. In addition to pain medication and antibiotics, he received eye drops four times a day. At first, these drops were administered through a special catheter tube inserted directly into his eye. After a few days, these tubes came out, and our animal care experts had to patiently wait for Solar to open his eyes before they could deliver his eye drops. Solar’s recovery following his surgery has been a slow process, and this may be because his brain first had to learn “how” to see. When an animal is born with cataracts, as we suspect Solar was, its brain doesn’t know how to interpret input from the eyes. It may take some time before the brain learns what to do with these visual signals. In some cases, the animal may never learn to see, even if its eyes are working, because the brain no longer has the pathways to understand any information from the eyes. Although it took Solar quite a while before he was able to see, it’s now clear that his cataract surgery was a success. He is able to track his caregivers when they enter his pen, and he eats the fish offered to him in the pool. For Koret Foundation Veterinary Intern Greg Frankfurter, Solar’s case reminded him of one of the first patients he treated at The Marine Mammal Center: an elephant seal named Cappy, who also suffered from cataracts in both eyes. Cappy’s vision was restored after a successful cataract surgery just like Solar’s, and he was released back to the ocean last October, four months after arriving at the Center for treatment. Since then, he has been spotted several times and seems to be doing quite well in the wild. Dr. Frankfurter and our veterinary team consulted Cappy’s patient records as they developed a treatment plan for Solar, building on what they had learned to provide the very best care possible. Although Solar is still on the road to recovery, we have high hopes that he will follow in Cappy’s footsteps and eventually be able to return to his ocean home. As for Dr. Frankfurter, his year-long internship sponsored by the Koret Foundation comes to a close much like it began: helping a blind elephant seal find his way in the world. Inspired by the challenges he saw here at the Center, Dr. Frankfurter plans to create a nonprofit organization focused on developing new technology for wildlife conservation professionals. You can help The Marine Mammal Center do the groundbreaking work that helps humans as well as pinnipeds! Your donation goes a long way to further innovative scientific breakthroughs. Learn about Northern elephant seals! Learn about California sea lions! Read about the Innovative cataract surgery Cappy received. Find Out About the Groundbreaking Work Taking Place at The Marine Mammal Center! 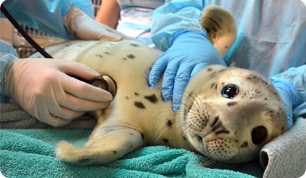 Find Out What's Happening at The Marine Mammal Center!